WOW!!! This book was great. I finished it last night and I miss it already. People get ready 'cause Momma is excited and wants to tell you all about this story. First of all, it takes place from 1135-1174. That's right ... Middle Ages my friends. Now I'm not a history buff, that's for sure, but this book is so well written that it pulls you in. I loved the characters, some were born & died all in the span of this one book. Now, this is a piece of literature, not just a book. It's not a light read, nor a short read. No wonder Oprah has it on her book club and was one of her "favorite things" in 2007. Now, it's one of my favorite things too. The book begins with Tom Builder, a mason looking for work through the English countryside. He (through a series of events) ends up in Kingsbridge (through another series of events) to build their cathedral. I never would have thought I would find building a cathedral so interesting. The story not only is a great tale in and of itself, but it shows the power religon played back in the middle ages and how the true spirit of religon is manipulated into fear to control men and thier leaders. What a great book. I want to tell everyone all about this book, spread the word! It's that good. I want to tell all of you the story, but I would ruin it if I told you more. Do yourself a favor get this book, read this book and most of all....enjoy this book! Momma says so! I am def. 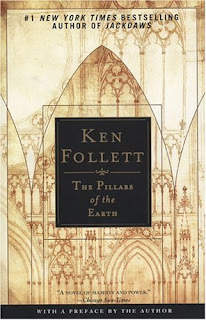 going to pick up "The Pillars of the Earth" next time I get out for some "me" time, since you gave it such a glowing review. Love to you and A. Appreciate the review. I may consider reading it because of your recommendation but never because Oprah says I should.